Plants annual. Culms 20-70(112), often decumbent and rooting at the lower nodes. Sheaths keeled, usually sparsely pubescent with papillose-based hairs; ligules 0.5-2.6 mm; blades 2-11(14) cm long, 3-8(12) mm wide, usually with papillose-based hairs on both surfaces, sometimes glabrous. Panicles with 4-13 spikelike primary branches, these subdigitate or on rachises to 6 cm; primary branches 3-30 cm long, 0.7-1.5 mmwide, flattened and winged, wings more than 1/2 as wide as the midribs, lower and middle portion of the branches with spikelets in unequally pedicellate pairs, pedicels not adnate to the branches; secondary branches rarely present. 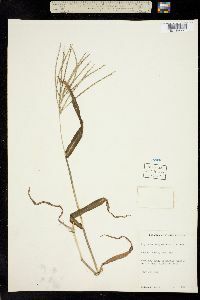 Spikelets homomorphic, 1.7-3.4 mm long, 0.7-1.1 mm wide. 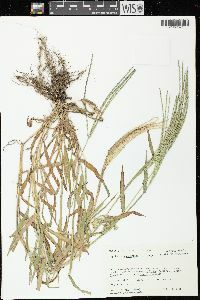 Lower glumes 0.2-0.4 mm long, veinless; upper glumes 0.9-2 mm, 1/3-1/2 as long as the spikelets, 3-veined, pubescent on the margins; lower lemmas usually exceeded or equaled by the upper florets, sometimes exceeding them but by no more than 0.2 mm, glabrous, 7-veined, lateral (or all) veins scabrous throughout or smooth on the lower 1/3(1/2) and scabrous distally, 3 middle veins usually widely spaced, remaining veins on each side close together and near the margins; upper lemmas 1.7-3 mm, yellow or gray, frequently purple-tinged when immature, often becoming brown at maturity; anthers 0.5-0.9 mm. 2n = 36, 28, 34, 54. 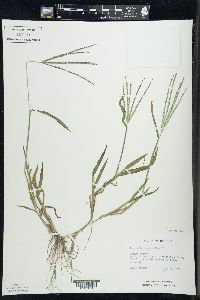 Digitaria sanguinalis is a weedy Eurasian species that is now found in waste ground of fields, gardens, and lawns throughout much of the world, including the Flora region. 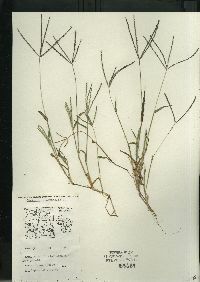 Annual herb 20 cm - 1 m tall Leaves: alternate, two-ranked. Sheaths open, keeled, sparsely hairy with bumpy-based hairs. Ligules 0.5 - 2.5 mm long, membranous. Blades 2 - 12 cm long, 3 - 8 mm wide, flat, parallel-veined, sometimes with bumpy-based hairs. 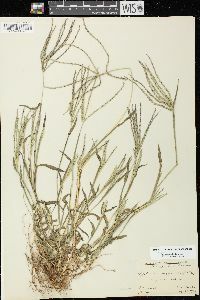 Inflorescence: a terminal arrangement of spikelet-bearing branches (panicle). Primary branches four to thirteen, nearly palmate (or on axes to 6 cm), 3 - 30 cm long, 0.5 - 1.5 mm wide, spike-like, compressed and winged. Rarely having secondary branches. Fruit: a caryopsis, indehiscent, enclosed within the persistent lemma and palea, flat on one side and convex on the other (plano-convex). Culm: often decumbent, 20 cm - 1 m long, round in cross-section, rooting at the lower nodes. 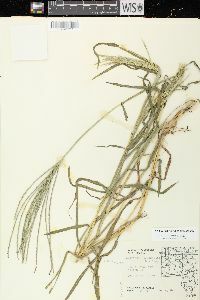 Spikelets: 1.5 - 3.5 mm long, 0.5 - 1 mm wide. Florets: two per spikelet. Lower florets sterile. Upper florets bisexual. Anthers three, 0.5 - 1 mm long. Stigmas red. 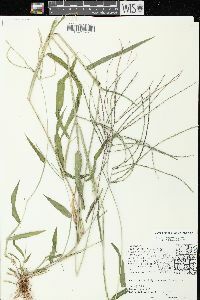 Glumes: Lower glumes to 0.4 mm long, lacking veins. Upper glumes 1 - 2 mm long, one-third to one-half as long as spikelet, three-veined, hairy along the margins. Lemmas: Lower lemmas equal to upper lemmas, more or less equal to upper florets, seven-veined (unequally spaced), membranous. Upper lemmas grayish or yellow, often tinged purple when young, becoming brown at maturity, 1.5 - 3 mm long, obscurely veined, with margins that embrace the upper paleas. Paleas: Lower paleas absent. Upper paleas similar in size and texture to upper lemmas. Habitat and ecology: Introduced from Europe. 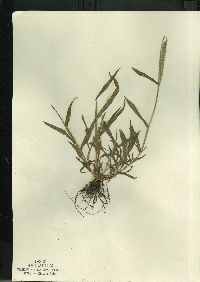 Common in a variety of habitats, including lawns and waste ground. It is also found in railroad ballast and cultivated fields. 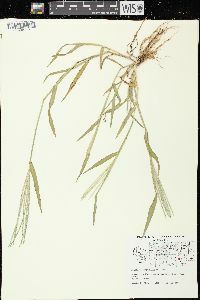 Etymology: Digitaria comes from the Latin word digitus, meaning finger, referring to the digitate inflorescence of some species. Sanguinalis means "stanching blood," referring to the plant's supposed ability to stop bleeding. This species is a common weed throughout the state, especially in truck gardens, lawns, gardens, and cultivated grounds of all kinds. 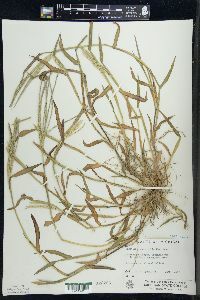 Decumbent or prostrate, much branched, rooting at the nodes, usually 3-6 dm; sheaths and blades papillose-pilose, the blades 4-10 cm × 5-10 mm; racemes 3-6 in each of 1-3 whorls, 5-15 cm; rachis 1 mm wide, broadly winged, scabrous on the margins; pedicels triquetrous, scabrous; spikelets 2.4-3.2 mm; first glume minute, often deciduous, the second 0.8-1.8 mm, a third to three-fifths the length of the spikelet; sterile lemma usually scabrous on the 5 strong veins; fertile lemma grayish-brown; 2n=18-76, mostly 36. Native of Europe, now cosmop. and established as a weed of lawns, fields, gardens, and waste places throughout our range and w. to the Pacific, giving way southward to no. 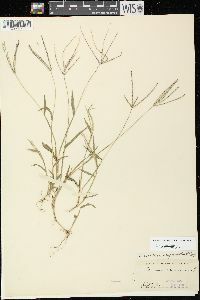 5 [Digitaria ciliaris (Retz.) Koeler].